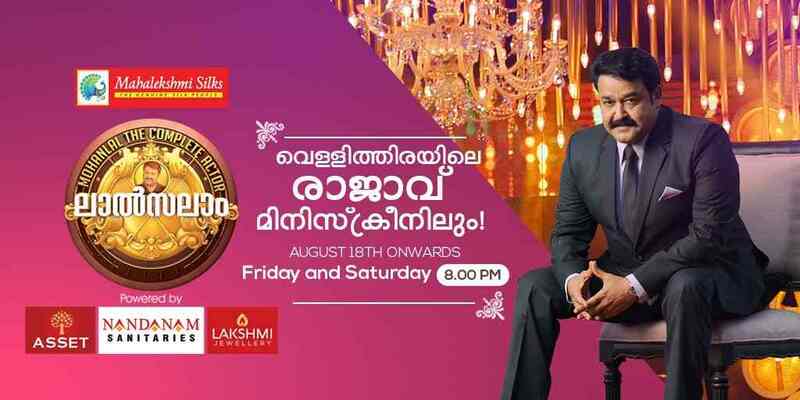 Leading malayalam general entertainment channel amrita tv launching lalsalam mohanlal show from today. laalsalam will be a entertaining show to the viewers, which will cover all about mohanlal. laalsalam is hosted by popular actress and rj meera nandan. mohanlal completed 37 years in film filed, he is oe of the most popular indian actor. As mentioned above Lalsalam show is about Mohanlal and will take the audience through the memorable moments of his acting career. Popular film technicians, actors will appear in this show and amrita tv doing huge promotions. Actress-turned-RJ Meera Nandan will be host the show laalsalam, please remember that his show have no connection with the movie with same title. Presence of mohanlal is the highlight of this show , few years back Kairali TV aired a show with same format. Amrita tv doing huge promotions for this show, advertisement on all leading newspapers. They have written ” HD Active ” under the logo, hope HD Version of the Channel will be soon. Kerala tv published onam 2017 premier films of Amrita tv. They are bringing latest malayalam premiers like 1971 Beyond boarders, ezra, angamali diaries etc during onam season. Sandhyadeepam, Satyam Shivam Sundaram, Aparichitha, Kaali Gandaki, Aliyan Vs Aliyan, Jagratha, Kathayallithu Jeevitham, Padmasree Padmavathi, Grand Magical Circus erc are some of the popular shows going on Amrita Television. All the latest episodes of lalsalam show and other amrita tv programs are available through youtube. this show will be a visual treat to all the lovers of actor mohanalal. he started his film career through the movies thiranottam (unreleased), manjil virinja pookkal etc.